Johns Hopkins engineers and cardiology experts have teamed up to develop a fingernail-sized biosensor that could alert doctors when serious brain injury occurs during heart surgery. By doing so, the device could help doctors devise new ways to minimize brain damage or begin treatment more quickly. In the Nov. 11 issue of the journal Chemical Science, the team reported on lab tests demonstrating that the prototype sensor had successfully detected a protein associated with brain injuries. In lab tests, this small biosensor detected a protein associated with brain injuries. Photo by Weiguo Huang. “Ideally, the testing would happen while the surgery is going on, by placing just a drop of the patient’s blood on the sensor, which could activate a sound, light or numeric display if the protein is present,” said the study’s senior author, Howard E. Katz, a Whiting School of Engineering expert in organic thin film transistors, which form the basis of the biosensor. The project originated about two years ago when Katz, who chairs the Department of Materials Science and Engineering, was contacted by Allen D. Everett, a Johns Hopkins Children’s Center pediatric cardiologist who studies biomarkers linked to pulmonary hypertension and brain injury. As brain injury can occur with heart surgery in both adults and children, the biosensor Everett proposed should work on patients of all ages. He is particularly concerned, however, about operating room injuries to children, whose brains are still developing. He said that recent studies found that after heart surgery, about 40 percent of infant patients will have brain abnormalities that show up in MRI scans. The damage is most often caused by strokes, which can be triggered and made worse by multiple events during surgery and recovery, when the brain is most susceptible to injury. These brain injuries can lead to deficiencies in the child’s mental development and motor skills, as well as hyperactivity and speech delay. To create this sensor, materials scientist Katz turned to an organic thin film transistor design. In recent years sensors built on such platforms have shown that they can detect gases and chemicals associated with explosives. These transistors were an attractive choice for Everett’s request because of their potential low cost, low power consumption, biocompatibility and their ability to detect a variety of biomolecules in real time. Futhermore, the architecture of these transistors could accommodate a wide variety of other useful electronic materials. The sensing area is a small square, 3/8ths-of-an-inch on each side. On the surface of the sensor is a layer of antibodies that attract GFAP, the target protein. When this occurs, it changes the physics of other material layers within the sensor, altering the amount of electrical current that is passing through the device. These electrical changes can be monitored, enabling the user to know when GFAP is present. Through the Johns Hopkins Technology Transfer Office, the team members have filed for full patent protection for the new biosensor. Katz said the team is looking for industry collaborators to conduct further research and development of the device, which has not yet been tested on human patients. But with the right level of effort and support, Katz believes the device could be put into clinical use within five years. “I’m getting tremendous personal satisfaction from working on a major medical project that could help patients,” he said. The lead author of the Chemical Science paper was Weiguo Huang, a postdoctoral fellow in Katz’s lab. Along with Everett and Katz, the co-authors, all from the Whiting School of Engineering and the School of Medicine, were Kalpana Besar, Rachel LeCover, Pratima Dulloor, Jasmine Sinha, Josue F. Martinez Hardigree, Christian Pick, Julia Swavola, Joelle Frechette and Michael Bevan. Funding for the sensing project was provided by the Cove Point Foundation and the Johns Hopkins Environment, Energy, Sustainability and Health Institute. Fundamental materials characterization was funded by the U.S. Department of Engery Grant Number DE-FG02-07ER46465. 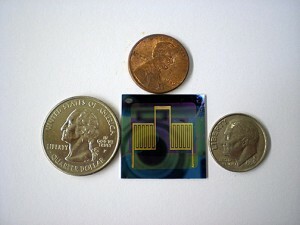 Color photo of the biosensor available; contact Phil Sneiderman.